New Delhi: Fiducial markers sales are anticipated to surpass 100 Mn by 2019, registering an upswing from 93.9 Mn in 2018, according to a Fact.MR study. As fiducial markers gain traction in parallel to rising incidences of various cancer forms affecting lung, prostate, abdomen and kidney, the growth potential of the market is set to witness a considerable rise. The escalating demand for fiducial markers can be accredited to the growing adoption of radiotherapy devices by oncologists; surging demand for IGRT and SBRT procedures; versatility of fiducial markers in effective diagnosis; and increasing rates of cancer across the globe. As per the study, the adoption of fiducial markers for prostate cancer have been witnessing a persistent increase, driven by their ability in terms of seamless target precision. Thus, rising adoption of fiducial markers as an effective tool for use in case of radiation treatment is fostering its popularity. Use of fiducial markers for prostate cancer is on a steep rise by virtue of its effectiveness in individualizing patient care in advance detection, diagnosis, and treatment. 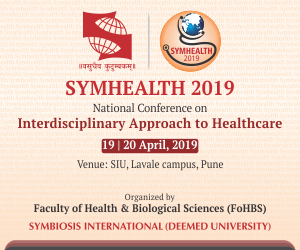 Furthermore, adoption of fiducial markers to address rising incidences of breast cancer is also proliferating at an impressive rate, wherein markers are implanted in the target area to mitigate the risk of cancer recurrence. According to the study, pure gold fiducial marker will outsell all other product types in 2019, with an estimated valuation worth US$ 60 Mn by 2019. Greater reliability and superior stability are the prime factors responsible for escalating demand for pure gold fiducial marker. The study also unveils that competency of pure gold fiducial markers to provide high-quality resolution is another key reason fueling its buoyancy in the global market space. While pure gold fiducial markers continue to be profitable, demand for metal-based fiducial markers is also foreseen to scale new heights owing to their ability in providing superior accuracy in target delivery of beam of radiation. Among all the end-users including hospitals, radiotherapy centers, and cancer research centers, sales of fiducial markers are expected to witness a notable uptick in the radiotherapy centers with an anticipated valuation surpassing US$ 39 Mn in 2019. Escalating adoption to treat various forms of cancer or malignant tumor is the predominant reason fostering sales of fiducial markers in radiotherapy centers. According to the report, North America continues to portray significant opportunities for the manufacturers of fiducial markers, with the U.S. spearheading in terms of demand. The fiducial markers market landscape portrays monopoly of leading players with established brand images and significant product portfolios. Diversification and expansion of existing product lines with new additions remain the key focus areas of the key players. The report states that leading players in the fiducial markers market are also investing in extensive research and development to foster seamless product development. Expansion of the customer base through product marketing via online portals is another significant approach adopted by the well-established players in the fiducial markers market. 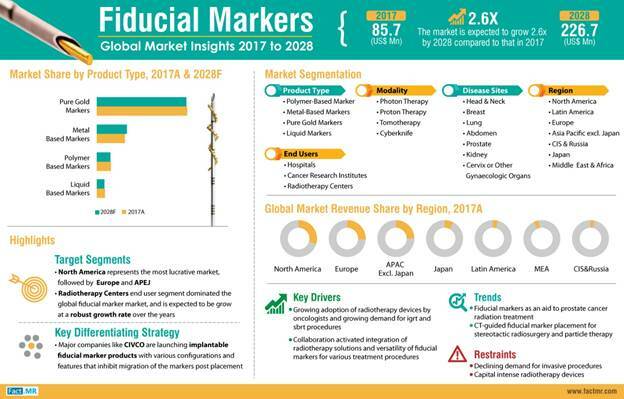 The report predicts that fiducial markers market is likely to expand at a CAGR of over 9% through 2028.